Central heating with a furnace is an idea that is centuries old. One of the earliest forms of this idea was invented by the Romans and called a hypocaust. It was a form of under-floor heating using a fire in one corner of a basement with the exhaust vented through flues in the walls to chimneys. This form of heating could only be used in stone or brick homes. It was also very dangerous because of the possibility of fire and suffocation. Furnaces generate heat by burning fuel, but early furnaces burned wood. In the seventeenth century, coal began to replace wood as a primary fuel. Coal was used until the early 1940s when gas became the primary fuel. In the 1970s, electric furnaces started to replace gas furnaces because of the energy crisis. Today, the gas furnace is still the most popular form of home heating equipment. Wood and coal burning furnaces required constant feeding to maintain warmth in the home. From early morning to late at night, usually three to five times a day, fuel needed to be put in the furnace. In addition, the waste from the ashes from the burnt wood or coal must be removed and disposed. Today's modern furnace uses stainless steel, aluminized steel, aluminum, brass, copper, and fiberglass. Stainless steel is used in the heat exchangers for corrosion resistance. Aluminized steel is used to construct the frame, blowers, and burners. Brass is used for valves, and copper in the electrical wiring. Fiberglass is used insulate the cabinet. 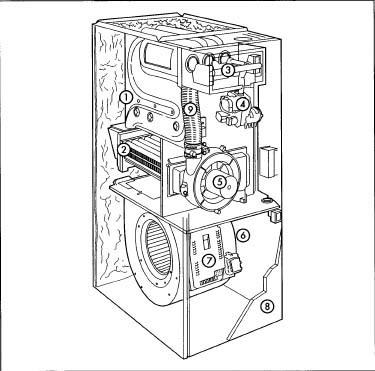 The original gas furnace consisted of a heat exchanger, burner, gas control valve, and an external thermostat, and there was no blower. Natural convection or forced air flow was used to circulate the air through large heating ducts and cold air returns to and from each room. This system was very inefficient—allowing over half of the heated air to escape up the chimney. Today's gas furnace consists of a heat exchanger, secondary heat exchanger (depending on efficiency rating), air circulation blower, flue draft blower, gas control valve, burners, pilot light or spark ignition, electronic control circuitry, and an external thermostat. The modern furnace is highly efficient—80-90%, allowing only 10-20% of the heated air to escape up the chimney. 1. An 'S"-curve primary heat exchanger. 2. Secondary heat exchanger. 3. In-shot burners. 4. Gas valve. 5. Draft motor. 6. Fan motor. 7. Ignition system. 8. Steel cabinet. 9. Exhaust pipe. gases to escape up the chimney. The transferred heated air is circulated throughout the home by a large blower and heating ducts. The primary heat exchanger is formed from two separate pieces of 409 stainless steel sheet. Each half is formed into shape by a 400 ton hydraulic press. The two halves are then fused together by a 25 ton hydraulic press. The secondary heat exchanger is formed from 29-4°C stainless steel tubing and fins. The fins are welded to the tubing to form a radiator type configuration. The primary heat exchanger is crimped to the secondary heat exchanger through a transition box. The flue draft blower is attached to the secondary heat exchanger. The burners are constructed of aluminized steel and arrive at the plant preformed. They are then attached to a plate on the input side of the primary heat exchanger. There is one burner for each heat exchanger in the furnace. The vendor supplied gas control valve is mounted to the heat exchanger and burner assembly. It is connected to the burner through a pipe. The air circulation blower housing is formed through the same hydraulic press formation as the primary heat exchanger. The vendor supplied motor and squirrel cage rotor are connected and attached to the blower housing with brackets. A plate is then attached for mounting the blower assembly to the heat exchanger assembly. Another mounting plate containing the vendor supplied furnace control circuitry and transformer are attached to the blower housing. The air circulation blower assembly is then mounted to the heat exchanger assembly with screws and nuts. The cabinet consists of two doors and the cabinet housing. The cabinet housing is supplied as a flat pre-painted sheet of steel and placed in a hydraulic press to form a three sided configuration. Sheets of fiberglass insulation are glued to the sides of the cabinet. The cabinet is installed around the furnace assembly and secured with screws and nuts. The doors are installed on the front of the cabinet assembly. The completed assembly is boxed and prepared for shipment. Each completed furnace undergoes an extensive series of tests. Checks for proper operation of the flue draft and air circulation blowers are performed. The gas valve is checked for proper operation. The heat output of the furnace in BTUs is measured. A dielectric test is performed for shorts. Scrap metal from cutting and forming operations are collected and sent to recycling plants for reclamation. Any excess piping is either reused or discarded. Defective steel sheets can be sent back tot he manufacturer and reformed, depending on the extent of the damage. The majority of the components of the furnace are able to be recycled. Furnaces have come a long way in the past 30 years. A primary focus by manufacturers is zone control of every room in the home. Each room will have a thermostat that will regulate heat flow to that individual room. As technology advances, these thermostats will be able to process voice commands or commands placed through a cell phone or computer. "Hypocaust." The Romans in Britain Web Page. December 2001. < http://romans-inbritain.org.uk >. Armstrong Air Conditioning Web Page. December 2001. < http://www.aac-inc.com >.